17th century shipwreck in Lake Michigan? 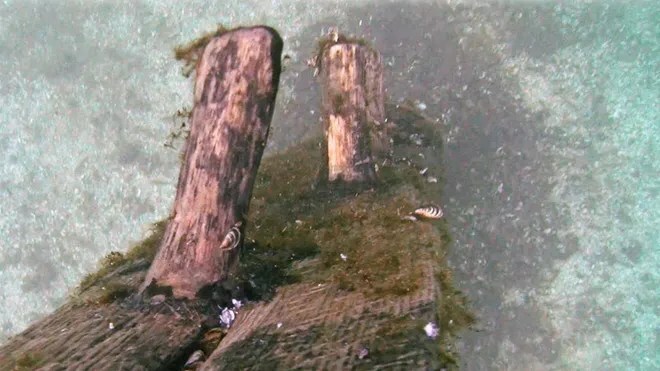 TRAVERSE CITY, MICH. – Five months after divers searched a remote section of Lake Michigan for a mysterious 17th century ship and retrieved a wooden slab the group leader believes is part of the vessel, it’s still uncertain whether they are on the right track. The object of the weeklong mission in June was the Griffin, built by the legendary French explorer La Salle, which disappeared in 1679 with its six-member crew, becoming the oldest known shipwreck in the upper Great Lakes. The dive team dug a deep hole at the base of the nearly 20-foot-long timber, which was wedged vertically into the lake floor, hoping other wreckage was beneath. To their disappointment, they found nothing. Since then, the beam has undergone a CT scan at a Michigan hospital. A wooden sliver has been sent to a Florida lab for carbon-14 analysis. Three French experts who participated in the expedition have completed a report. Others are in the works, as scientists who have examined the slab or data from the tests compile their findings. Thus far, most have declined to take a position on whether the Griffin has been found. “Based on the totality of the scientific results thus far, as well as historical research, to this point there are still two valid theories” about the wooden beam, said Ken Vrana, who served as project manager for the expedition. It could be part of a ship, or a “pound net stake” — an underwater fishing apparatus used in the Great Lakes in the 19th and early 20th centuries, he said. Dean Anderson, Michigan’s state archaeologist, who has long been skeptical that the beam came from the Griffin, told The Associated Press last week he is convinced the latter alternative is correct. That theory is hotly disputed by Steve Libert, president of Great Lakes Exploration Group, who has spent three decades and more than $1 million on his quest for the Griffin. He contends the slab is a bowsprit — a spur or pole that extends from a vessel’s stem — which broke off and was jammed into the lake bed as the ship sank during a violent storm. His view is bolstered by findings of the French team, which included Michel L’Hour, director of the Department of Underwater Archaeological Research in the French Ministry of Culture and an authority on shipwrecks. Their report, which L’Hour shared with the AP, casts doubt on the stake theory, noting that the slab doesn’t have a sharp, pointed end typical of submerged stakes found elsewhere. Instead, it has a sloping “beveled” end similar to those of bowsprits of wrecked European vessels from the 16th and 17th centuries that have been recovered, the report says. 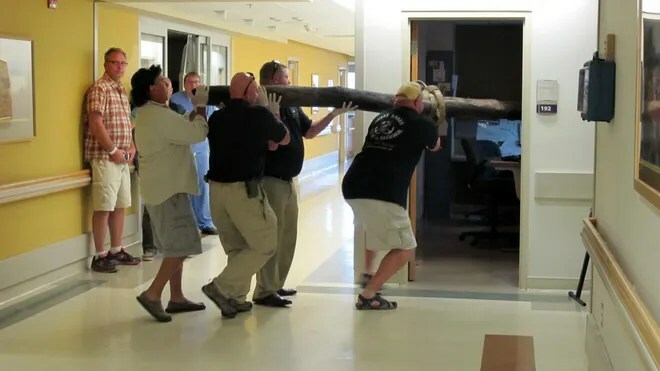 In August, Libert arranged to have the slab x-rayed with a CT scan machine at Otsego Memorial Hospital in Gaylord, hoping to obtain tree ring images that would determine its age. Only 29 rings were visible. Carol Griggs, a Cornell University expert in using ring patterns to date trees, said at least 50 were needed for an accurate measurement. So yet again, the results were inconclusive. Libert also sent a sliver from the timber’s interior to Beta Analytical Inc., a Miami company that performs carbon-14 tests on archaeological and geological artifacts. The results were similar to radiocarbon analysis performed on other pieces from the slab a decade ago. They found the wood could have originated from any of several periods between 1670 and 1950. Darden Hood, the company’s president, said in an interview “it could be misleading” to narrow down the time range any further. But William Lovis, a Michigan State University anthropology professor who reviewed the findings at Anderson’s request, said a computer program that uses tree-ring data to refine carbon-14 test results indicates a greater likelihood that the timber came from the 1800s than the late 1600s. Libert, however, said the carbon-14 findings support his position by failing to rule out that the beam dates from the 17th century. 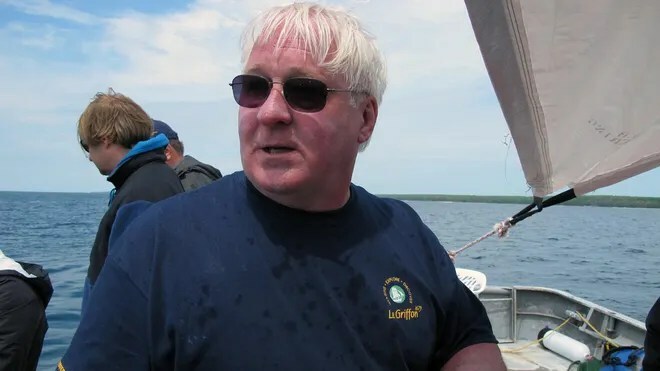 He said that fact, combined with other historical and archaeological data, makes a strong case that he’s recovered the Griffin bowsprit — and that other wreckage is waiting to be found in the same area. He plans to resume the search next spring. “This would be probably the most important archaeological find in this country’s history,” he said.